Together with Prof. Wong Poh Kam, CEO Dr. Neo and CMO Sean Seah holding the Prize Award. 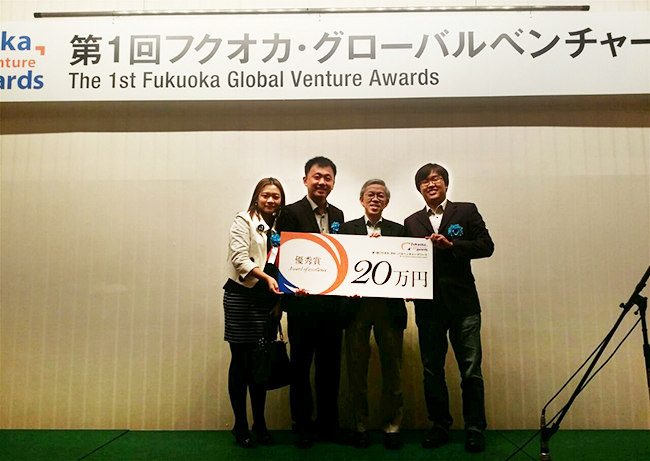 FUKUOKA, October 18, 2014 – KAI Square was awarded with the Award of Excellence at Fukuoka Global Venture Awards. The Fukuoka Global Venture Awards is a business plan contest for Japanese companies expanding internationally or foreign venture firms aiming to establish a presence in Japan. Dr. Neo Shi Yong, CEO of KAI Square said, “To win the Award of Excellence is a special honour as the Japanese judges foresee a potential in our solutions for the Japanese market”. He was the representative of KAI Square for this competition and provided insights about their signature product, Video-Analytics-as-a-Service (VAaaS). VAaaS is an off-the-shelf video analytics solution that rides on KAI Square’s flagship product, KAI Unified Platform. VAaaS helps users, such as retailers, analyse video footages from surveillance cameras to gain insights about their businesses, such as customer demographics, number of people visiting their stores, effectiveness of marketing campaigns, staff allocation and more.